What are Electronic Currencies? Electronic currencies are online payment gateways used popularly all over the world as a mean of payment for various online transactions. E currencies makes online payment easy and accessible because it enables easy funding and payment. It can be used to shop online, sell online, buy and make payments. Examples of e-currencies includes Perfect Money, Bit coin, Payza, PayPal, Webmoney, Okpay, Qiwi, Liqpay and many more. Despite the advantages of these various E-currencies, many people still find it difficult to fund right here in Nigeria but seems to be easy in other part of the world. 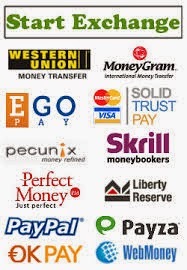 I decided to add this site because its reliable and i have exchanges my perfect money, Payza, Webmoney, Paypal account with the exchanger on many occasions.